The Leclerc is a main battle tank (MBT) built by Nexter of France. It was named in honour of General Philippe Leclerc de Hauteclocque who led the French element of the drive towards Paris while in command of the Free French 2nd Armoured Division (2ème DB) in World War II. In 1964 studies were initiated about a possible replacement vehicle for the AMX 30: the Engin Principal Prospectif. In 1971, in view of the inferiority of the AMX 30 in comparison to the new generation of Soviet tanks about to be introduced, the Direction des Armements Terrestres ordered the beginning of the Char Futur project. In 1975 a working committee was created that in 1977 agreed on a list of specifications. In February 1980 however, a Memorandum of Understanding was signed with the Federal Republic of Germany involving the joint development of a MBT, called the Napoléon I in France and Kampfpanzer III in Germany. Fundamental disagreements about its desired configuration led to a failure of this cooperation in December 1982. 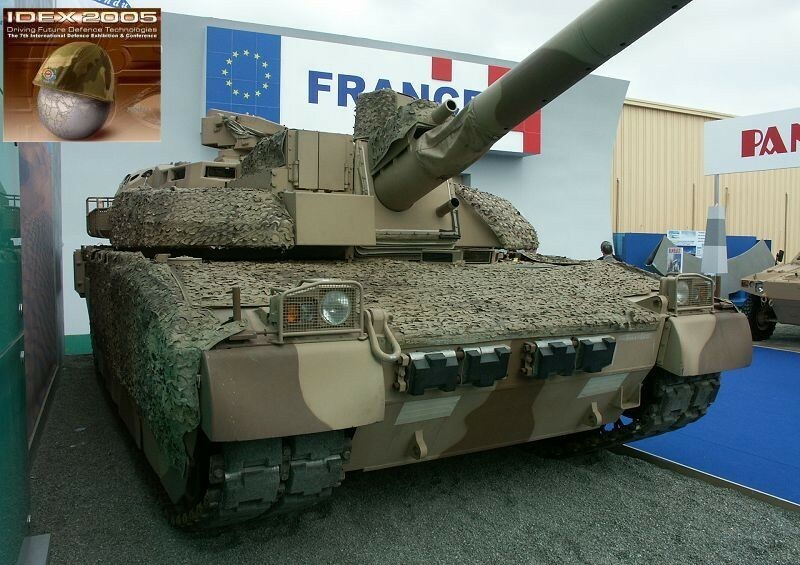 It was announced that a purely French battle tank would be developed, called "EPC" (Engin Principal de Combat). Importation of foreign equipment, like the M1 Abrams, the Leopard 2, or the Merkava had been studied and rejected. In contrast with most Western programmes of the time, much consideration was given to active, besides passive protection, to limit the overall mass of the vehicle. Mobility for evading incoming fire and firing control were given particular attention. Nevertheless it was a stated design goal to at least double the protection against KE-penetrators in comparison to the level attained in then current MBTs of the fifty ton weight class, the latter indicated at about 400 mm RHA equivalency, the higher level at the same time protecting against shaped charges. Partnership with a foreign state was sought to limit the cost per unit, and this was found when the United Arab Emirates ordered 436 vehicles, adding to the 426 units already planned for the French Army. In 1986, the project was started under the name of "Leclerc", six prototypes being built swiftly. Mass production started in 1990 with the four-unit first batch, used mainly for comparative tests in foreign countries. The 17 units of batches 2 and 3 were shipped, with improvements in the turret and in the hull armour. These units were diagnosed with problems in the engine and suspension, and were quickly retired. Batches 4 and 5 were better built, eliminating the recurrent problems in the powerplant, and are still in service, after having been refitted at the end of the 1990s. The second series started with batch 6, with an added climate control system in the right rear of the turret. Batch 7 introduced a transmission system to the command vehicle, and a data system giving instantaneous vision of the state of all battle tanks and acquired targets. It also incorporated minor improvements in the visor. Batch 8 was a modernisation of the electronic system, and batch 9 replaced the visor with a SAGEM Iris system with thermal imaging, which allows acquisition of targets at a greater range. All previous batches will be modernised up to the standards of batch 9 from 2005. In 2004, batch 10 was presented, incorporating new information systems which could share the disposition of enemy and friendly units to all vehicles and new armour. This is the beginning of the 96-unit third series. By 2007, 355 tanks should be operational, 320 of them incorporated in four regiments, each of 80 Leclerc vehicles. As of 2010 after a French defence review each of the 4 regiments operates 60 Leclerc tanks for a total of 240 in operational units with a further 100 Leclercs in combat ready reserve. 1er-11e Régiment de Cuirassiers stationed in Carnoux-en-Provence, part of the 3rd Mechanised Brigade. 6e-12e Régiment de Cuirassiers stationed near Orléans, part of the 2nd Armoured Brigade. 1er-2e Régiment de Chasseurs stationed near Verdun, part of the 7th Armoured Brigade. 501e-503e Régiment de Chars de Combat stationed in Mourmelon-le-Grand, 1st Mechanised Brigade. The Leclerc is equipped with a GIAT (Nexter) CN120-26 120mm smoothbore cannon. This cannon is theoretically capable of firing the same NATO standard 120mm rounds as the German Leopard 2 and US M1 Abrams, but in practice only custom French-produced ammunition is issued. The gun is insulated with a thermal sleeve and has an automatic compressed air fume extraction system instead of the usual bore evacuator. The Leclerc has a unique autoloading system which was specifically designed for it, and reduces the crew to three by eliminating the human loader. The turret of the Leclerc was designed around the auto-loading system in order to avoid the problems common to other tanks with an autoloader. The Leclerc autoloader allows a rate of fire of 12 shots per minute and holds 22 rounds of ready ammunition; it can accommodate up to five different types of ammunition at once, although like most autoloader systems it cannot change ammunition types once a round has been loaded. The most common types are the armour piercing fin-stabilised discarding sabot (APFSDS) with a tungsten core and the high explosive anti-tank (HEAT) round. There are 18 other rounds available for reload. A Leclerc tank can fire while traveling at a speed of 50 km/h on a target 4,000 metres away. The gun is 52 calibres long instead of the 44 calibres common on most tanks of the Leclerc's generation, giving the rounds a higher muzzle velocity. The Leclerc is also equipped with a 12.7 mm coaxial machine gun and a remote-controlled 7.62mm antiaircraft machine gun, whereas most other NATO tanks use 7.62mm weapons for both their coaxial and top machine gun mounts; the major exception is the American M1 Abrams, which has a 7.62mm coaxial machine gun and two top-mounted machine guns, one 7.62mm and one 12.7mm. The Leclerc has the Galix combat vehicle protection system from GIAT, which fires a variety of smoke grenades and infra red screening rounds, as well as anti-personnel grenades. The hull and the turret are made of welded steel fitted with modular armour, which can be replaced easily for repair or upgraded over the years. The French army in the late seventies rejected Chobham armour as being overly specialised in its optimisation to defeat hollow charge-weapons; it therefore opted to develop a steel perforated armour system, comparable to that on the early Leopard 2. When the Leclerc was introduced in the early nineties this was still considered adequate, due to the larger thickness of its modules compared to the armour of other modern western tanks, made possible — for a given weight limit — by the compact design of the tank as a whole. However during the nineties standards for tank armour protection increased, as exemplified by the Leopard 2A5, its main rival on the export market, being fitted with an additional spaced armour system. Thus it was decided to follow the Germans (Leopard 2A4) and British (Challenger 2) in their application of a titanium-tungsten system, which was introduced to the Leclerc in 2001, in Batch 10. The inner spaces are filled with NERA. The Leclerc has a FINDERS battle management system and an ICONE TIS digital communication system which integrates data from other tanks and upper levels of command. The Leclerc' digital fire control system can be operated independently by the gunner or the commander, and it offers real time integrated imaging from all of the tank's sensors and sights, including the gunner's SAVAN 20 stabilised sight, developed by SAGEM and the driver's night/day OB-60 vision system from Thales Optrosys. The system can track six targets concurrently and is very much like a similar system made by the same company for the Challenger 2 tank of the United Kingdom. The Leclerc has an eight-cylinder, Wärtsilä (ex SACM) V8X-1500 1,500 hp Hyperbar diesel engine and a SESM ESM500 automatic transmission, with five forward and two reverse gears. The official maximum speed by road is 72 km/h and 55 km/h cross country (speeds in excess of 80 km/h were reported on road). The maximum range is given as 550 km, and can be extended to 650 km with removable external tanks. The "hyperbar" system integrates a Turbomeca TM 307B gas turbine in the engine, acting both as a turbocharger and an APU giving auxiliary power to all systems when the main engine is shut down. At a combat weight of just 56 tons, the Leclerc is one of the lightest main battle tanks in the world; this gives it one of the best power-to-weight ratios among the Western tanks (27 hp per tonne) and makes it one of the fastest MBTs of its generation (0 to 32 km/h in 5 seconds). The engine exhaust, exiting at the rear left, is cooled to reduce the thermal signature of the tank. Transmission is a hydromechanical type with five forward and two reverse gears. Fuel tanks carry 1,300 litres and act as extra protection; two 200-litre external tanks can be fitted on the rear of the turret, but have to be jettisoned before entering combat since they limit turret rotation. The gear box is equipped with a hydrokinetic retarder which can slow the Leclerc down at a deceleration rate of 7 m/s² (0.7 g) which can be very useful at the last moment before it could be hit. The crew must be strapped in safely by their harnesses to use this. While having no notable experience in true warzone environments, the Leclerc has seen deployment on multiple low-intensity conflicts, including 15 Leclercs stationed in Kosovo in the context of UN peace-keeping operations, where their performance was judged satisfactory by French officials. Currently 13 Leclercs are deployed in the south Lebanon for a peacekeeping mission with the UNIFIL. Leclerc T1 and T2: the pre-production variant. was only built in 17 copies. Leclerc T6 to T8: have an added air conditioning system on the back roof of the turret, and an extra splash guard added to the front hull. Leclerc T9: Athos thermal camera replaced with a new thermal camera called Iris. Leclerc T10 and T11:this variant has an added command display, similar to the American IVIS, and German TCCS. it has also improved armour, which eliminates ballistic holes found in the previous variants. Leclerc AZUR:Action en Zone Urbaine, "Improve fighting ability in urban environments"
Leclerc used by the Army Forces of United Arab Emirates. EuroPowerPack with the MTU 883 diesel engine of 1,100 kW. The United Arab Emirates have interests in the German company which builds them (MTU) and preferred an engine of their own. This powerplant is more reliable than the French UDV 8X (1,100 kW), though it has small problems with the clutch. Completely automated driving and turret functions, for use by crew with only basic training. France: 406 + 20 armoured recovery vehicles. May retire 82 early model Leclercs from service. Qatar: Some were tested by the Qatari army, France hopes to sell about 40 second-hand Leclercs. Colombia: France offered Colombia a batch between 30 to 40 used main battle tanks from its inventory. The package was to include their modernization as well. The deal never was agreed upon by the Colombian authorities. ↑ 1.0 1.1 1.2 Gelbart, Marsh (1996). Tanks main battle and light tanks. Brassey’s UK Ltd. pp. 28–29. ISBN 185753168X. Chassillan, Marc(2005); Char Leclerc: De la guerre froide aux conflits de demain.